Your team puts a lot of work into Basecamp. Basecamp's reports are based on the information your team enters. It finds people's messages, comments, assigned and completed to-dos, and lets you know what everyone has been up to. To get all the news, click the Activity link, up at the top of your page. You'll see latest activity, along with the other report options. Note: Reports include all the projects you have access to in your Account. Reports cannot be run per project at the moment. It happens — sometimes you miss a deadline. 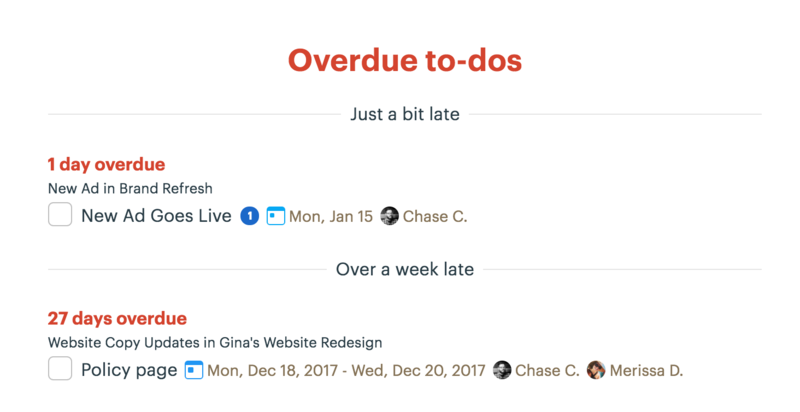 Basecamp looks at the due dates on your to-dos, and tells you what's late, and by how long. Want to know what's going on tomorrow, or next week, or next month? Basecamp can tell you! You'll get a list of your scheduled events and dated to-dos, broken out by project. You'll also see who's assigned to what, and who is involved in an event. This report lists new to-do items that were added to your projects, side by side with the to-dos that were completed. Everything is broken out by project. You'll see who is assigned, and who completed the to-do. Want to know what happened yesterday? You can go back day by day to review. Need to know what someone on your team is working on? Head to this section to scroll through everything that's assigned to them in Teams and Projects you share. Just want to see their to-dos with due dates? Click the Just the ones with due dates tab and you'll only see the assignments with due dates. 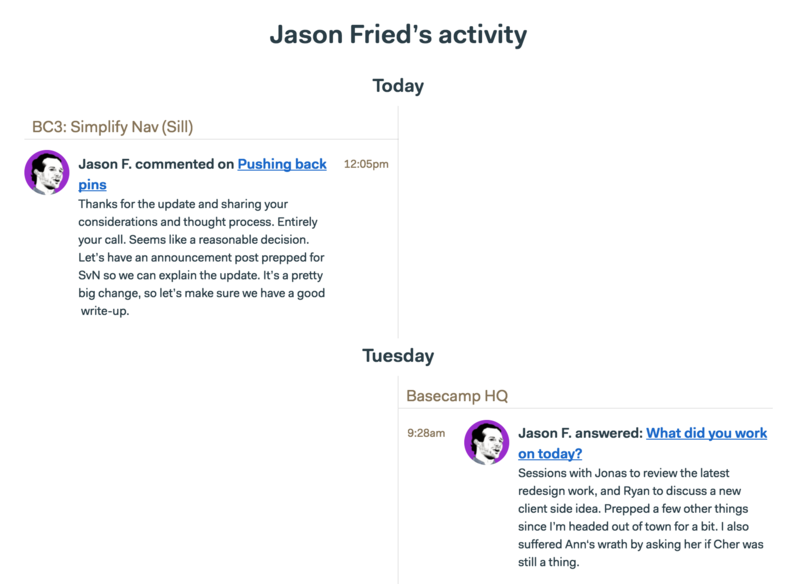 Want to see all the Basecamp activity for a specific person? Just select their name from the menu. 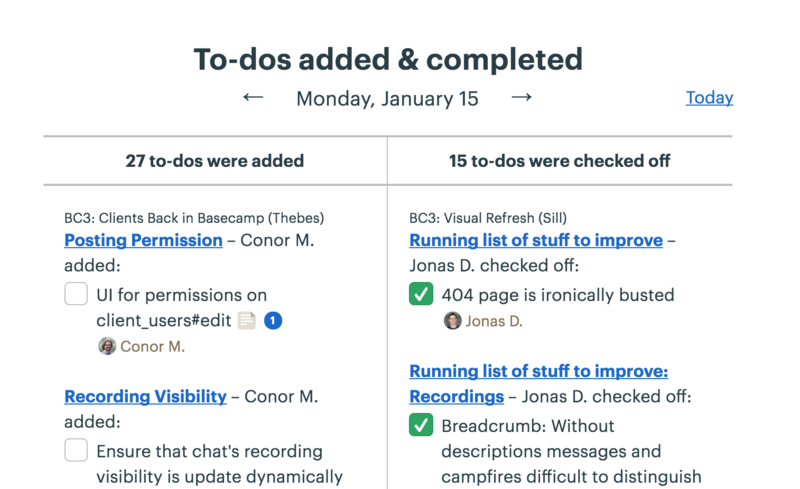 You'll see all their Basecamp activity across the Teams and Projects you share — all the to-dos they've added and completed, all the comments they've added, every file they've posted. Very handy!